Jeff Soto (interviewed) currently has a timed edition available with Prints On Wood through December 3rd. Entitled Nightgarden, the image for the wood print was taken from his 2015 Los Angeles exhibit of the same name (covered). Measuring 36″ x 10.5″, each one will come signed & numbered and cost $175. Head over here if you want to add it to your collection. Categories: Contemporary Art, Low Brow & Pop Surrealism, Releases. 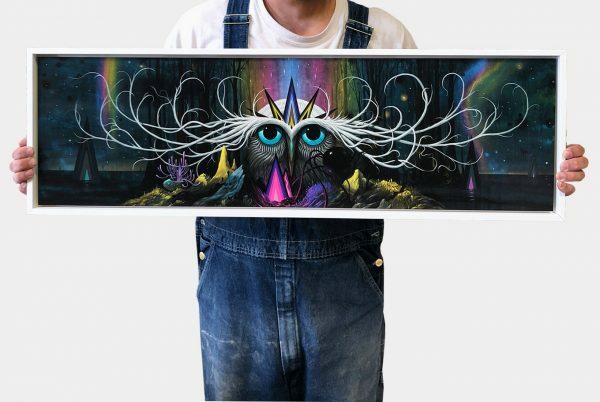 Tags: Contemporary Art, Jeff Soto, Low Brow & Pop Surrealism, Prints, Releases.